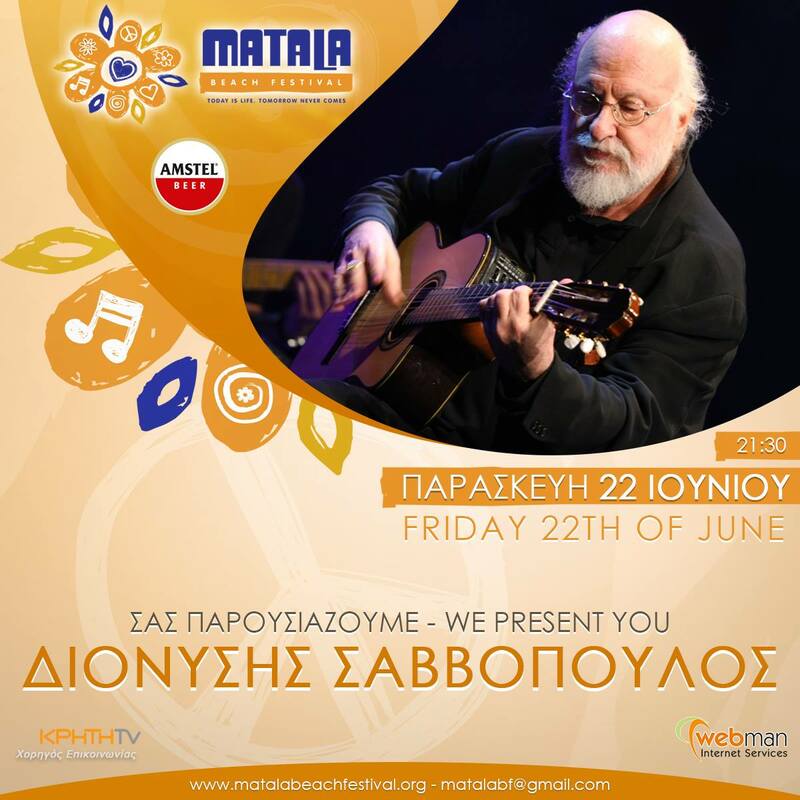 The Matala Beach Festival starts this year with Dionysis Savvopoulos! He comes to „tie“ with his songs to the place that carries the atmosphere of an era that has written history. Dionysis Savvopoulos is the forerunner of a musical stream that was called „Greek Songwriters“ in Greece. In 1963 he introduced songs that he interprets in his own lyrics and music. His songs compose the subject of Greek music because they started a kind that did not exist until then, synchronizing the aesthetics of Greek traditional music with the contemporary world musical trends. His interpretations and orchestrations are considered unique and unsurpassed. This is a musical fable in Greece. Journalists and audiences often call it „Greek Dylan“. He prefers to say he is „Greek Savvopoulos“. This year, the Matala Beach Festival will be launched and will present songs from all the years of its creation in its own unique way, accompanied by musicians, each of whom is a form of music in the country. They stand a performance that crosses the border and gives new meaning to what we call „world music“. A special presence next to him is the new songwriter and composer, Katerina Peli who has already started her own exciting musical journey. He has distinguished himself worldwide by conveying music to Pantelis Voulgaris‘ film „Nyfes“. He performs in both Greece and Brazil. Her lyrics and music come directly from the new culture of young people who move around the world as if they are home and write in comfortably in Greek, English and Portuguese.